Completed in 2007, Faribault Energy Park meets the region’s growing need for energy. But when MMPA developed the concept of creating a plant as a community asset, the goal was to accomplish much more than that. It is integrated into the community by providing education, recreation and aesthetic beauty. Students and residents touring the facility are able to view the control room and the steam turbine from the observation room. Set among the facility’s 35 acres of wetlands are educational displays demonstrating alternative energy sources including solar and wind energy. Visitors are able to use the park-like wetlands as recreation area, view the educational displays and even drop a fishing line into one of the ponds. At a cost of $180 million, Faribault Energy Park is owned and managed by MMPA and was financed through the sale of bonds. The facility is operated by NAES Corporation, who operates more than 80 plants of similar capacity in the United States. 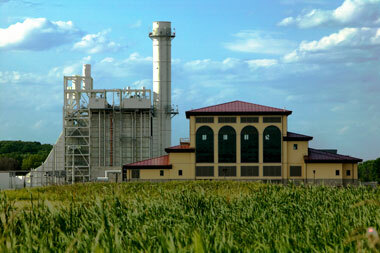 The plant runs during periods of higher demand for electricity, when other sources of energy are more expensive. The Faribault Energy Park observation room, which offers visitors a view of the plant’s control room and steam turbine, is open to school groups and other interested parties by appointment. The facility’s grounds, including walking trails and rainwater collection ponds, are open to the public during daylight hours.